You are here: Home » Regional news » Asia » Indonesia as Global Center for Halal Products and Services? Jakarta. As a country with the world’s largest Muslim population, Indonesia is also a huge market for halal products. “Many international companies have already observed this fact and have been marketing their products in our country,” former deputy minister for tourism Sapta Nirwandar said on Friday (07/10). Indonesia’s own halal products have also been increasingly popular. “As we can see, Indonesia’s halal foods, shariah banking and Islamic fashion industry have grown rapidly in the last five to six years. This shows a great [market] potential. We should all join together, support one another and grow the industry,” said Sapta, who is also chairman of the Indonesia Halal Lifestyle Center, a nonprofit organization aimed at promoting halal products and services. To address the market demand, the organization launched the Indonesia International Halal Lifestyle Expo and Conference at the Ciputra Artpreneur Center in South Jakarta on Thursday. Nearly 40 companies from the banking, food, fashion, cosmetics and tourism industries are participating in the three-day event, each of them offering their shariah-compliant products and services. During the seminar, international speakers, including Dr. James Noh of the Korea Institute of Halal Industry, Dr. M. Yanis Musdja of the Indonesia Halal Products Foundation and Winai Dahlan of the Halal Science Center at Thailand’s Chulalongkorn University, shared their views on halal products and lifestyles. “Winai Dahlan, the grandson of Indonesian national hero Ahmad Dahlan, gave an interesting insight on the actual health benefits of halal foods,” Sapta said. On the second day of the event, a series of religion-themed fashion collections were presented by Indonesian designers. “The expo draws people’s attention to Indonesia’s own halal products and Islamic fashion. It indeed helps the industry to grow bigger and stronger,” Deden said. The Elhijab brand presented its “Elzatta” and “Dauky” collections. The “Elzatta” collection offered its “Hijab for the World” loose-fitting tunics and abayas in cheerful colors, while “Dauky” presented slim-fit pantsuits with structured jackets and coats. “The ‘Dauky’ collection is inspired by streetwear styles of some of the world’s fashion capitals. With the new collection, we want to show that today’s women can look stylish and dynamic without forsaking religious requirements,” Elhijab general manager Ina Binandari said. 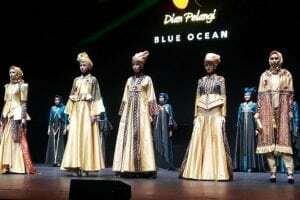 Fashion designer Dian Pelangi showcased the regal “Blue Ocean” women’s collection, inspired by the deep sea and sporting A-line evening gowns made of Palembang songkets in gold and sapphire-blue hues. “I’m impressed. Indonesian designers have indeed proven themselves capable of creating classy fashion collections, just like their counterparts in Paris and Milan,” Sapta said after the show. On Saturday, the last day of the expo, the visitors can watch “Kalam Kalam Langit” (“Heavenly Verses”), a film directed by Indonesian filmmaker Tarmizi Abka, and attend the concert of Indonesian jazz musician Dwiki Dharmawan at 8 p.m.
“We plan to organize this expo every year in October. We expect it to get bigger and bigger each year with more visitors from Indonesia and abroad,” Sapta said. He hopes that at least 5,000 visitors will attend this year’s event. “Our big dream is to establish Indonesia as the world’s qibla for halal products and services,” he said.